Garapa is the ideal lumber for those who seek a durable deck in a light color. ABS proudly carries decking materials made from this exotic lumber, including 4-by-4 posts and handrails. Use the lumber alone for your deck or pair it with Ipe or another hardwood to give your structure a unique look. Garapa known as Brazilian Oak is another dense and hard decking species. It is exclusive among all decking woods for its lemon-yellow color that creates a striking appearance. Garapa has a natural slip and is scratch resistant for those who like to walk barefoot outside. Buying Garapa wood could be a good option for it doesn’t require constant chemical treatments or maintenance to withstand mold and decay. At ABS Wood you can gain Grapa at affordable rates for all exterior application. It could be a perfect wood decking option if you are looking for a lighter color alternative that still has hardness and durability of a Brazilian hardwood. Garapa, also know as Brazilian oak, features a yellow-colored hardwood with a fine grain. Because of the nature of the wood, some boards have appealing streaks of brown in them. After exposing the boards to the sun, the yellow color becomes a beautiful russet golden brown. Because it comes from the Amazon rainforest, Garapa naturally resists water damage, insects, rot and decay. Items made from the strong lumber have a lifespan of 25 years or more, and the wood does not require any type of preservatives. We take pride in the method that we source and harvest our Brazilian hardwoods. They come from sustainable managed forests in South America. Unlike composite building materials, Garapa is naturally biodegradable. Garapa is comparable to IPÉ, but is available at a fraction of the cost. Decking Color: Garapa deck boards have a medium-brown color that can be darkened with a tinted finisher. As with all hardwoods, you’ll find variations in the color and grain, which will give your decking added interest and character..
Garapa Decking Hardness: On the Janka hardness scale for wood, Garapa has a hardness of 2280 lbf, making it harder than maple (1450 lbf) and oak (1360 lbf). Garapa Decking Durability: Garapa decking is durable and naturally resists termites and fungus as long as water doesn’t permeate the wood. The lumber’s hardness makes it scratch-resistance, so it’s a great choice for exterior decking. Garapa Decking Preservation: Because Garapa naturally resists water, insects, rot and decay, it does not require the use of a wood preservative. Sun exposure will cause the wood to darken with time, but a UV-blocking finisher can help preserve its golden honey color.r. Our Garapa decking is reliably harvested from the forest to provide you a renewable resource. 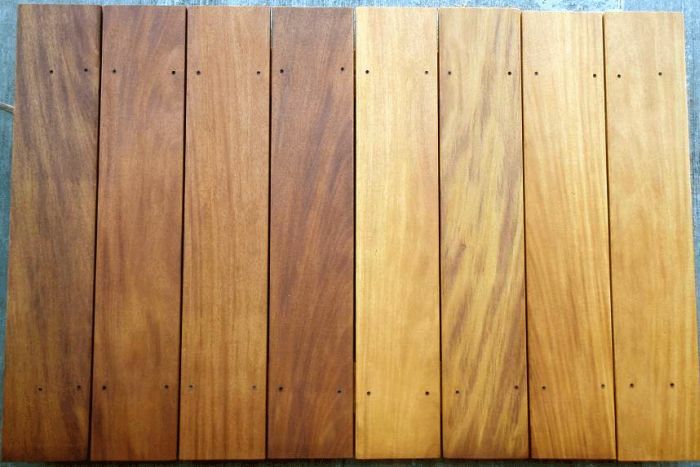 Garapa is as similar to Ipe and is available at a reasonable cost. We ship our decking products to your home or job site. So, if you are looking for Brazilian hardwood decking, look no further! Garapa 5/4x4 1" x 3 1/2"
Garapa Decking 5/4x4 Grooved 1" x 3 1/2"
Garapa 1x4 3/4" x 3 1/2"
Garapa Decking 1x4 Grooved 3/4" x 3 1/2"